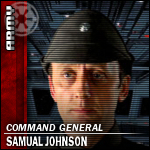 Samual Johnson's family went missing while traveling to Corellia on a business trip. Years later it was discovered that they had been captured by a small pirate group and were forced to help maintain the groups ships. They were rescued when an Imperial army patrol discovered and raided the pirate base. This page was last modified on 15 April 2019, at 01:44.